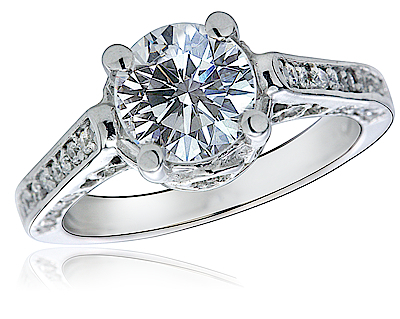 The Trinity Round Cubic Zirconia Antique Estate Cathedral Style Pave Solitaire Engagement Ring features a 1.5 carat 7.5mm round Russian formula cubic zirconia center with an elegant pave enhanced basket setting that features antique and estate style detailing. 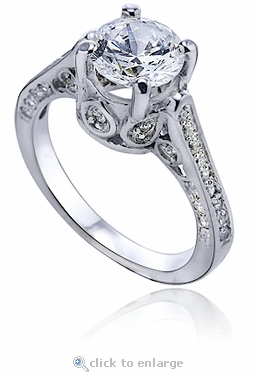 Additional pave set round cubic zirconia are set on all three sides of the shank in a delicate manner, and both sides of the cathedral shank flow up to reveal the beautiful round hand cut and hand polished Russian formula cubic zirconia center stone. 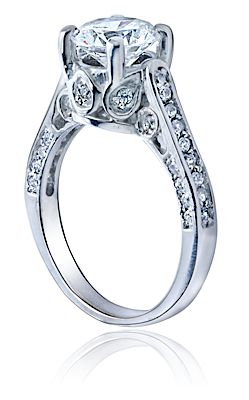 The beautifully designed cathedral mounting accentuates the center diamond look cubic zircona. The shank on this ring measures approximately 2.65mm in width and includes approximately 2.8 carats in total carat weight.